A couple of years ago, World Peas Brand took on the daunting task of creating a healthy crunchy cheese snack—a clean-label alternative to the national brand. 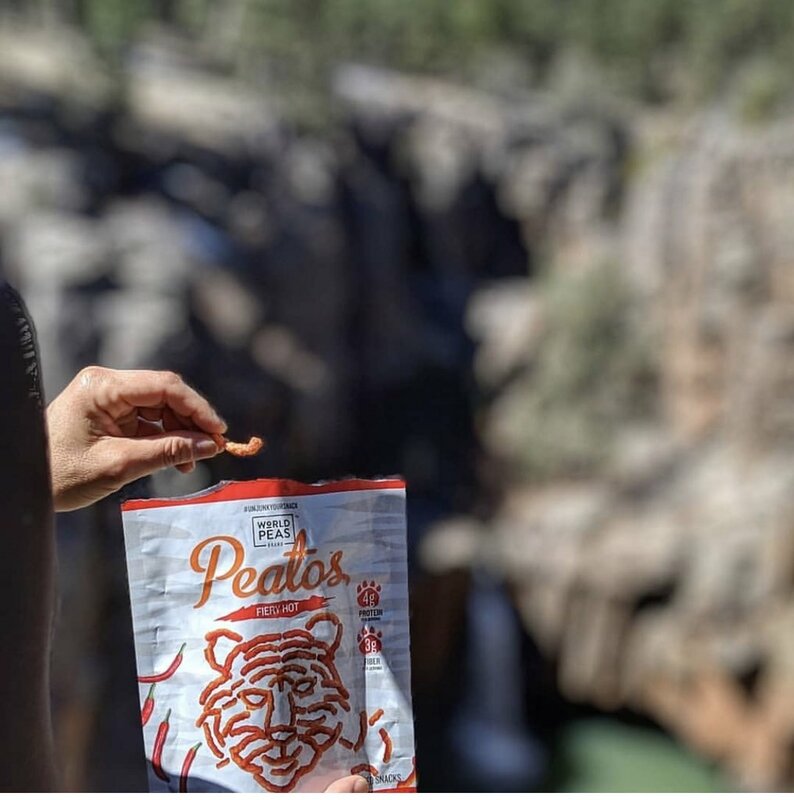 The company’s creation, Peatos, are made with a base of non-GMO peas and lentils (pulses) instead of corn, and the seasoning used contains no artificial flavors, colors or MSG. After Natural Products Expo West in March this year, interest in the product in the food retail trade “skyrocketed,” according to Nick Desai, chairman and CEO of Los Angeles-based World Peas. Kroger began selling the snack chainwide in May 2018. With that success buoying the company, World Peas plans to use Peatos as a springboard into other kinds of clean-label snacks, he says. “We are going to continue to go after every major junk snack category there is. The opportunities are endless.—it’s a $28 billion market,” Desai told The Shelby Report’s Bob Reeves, VP-West. Snacks similar to Takis or Funyuns, but made from a base of peas and lentils, may be next for World Peas, he said. A former investment banker, Desai acquired a company in 2011 whose business was trail mixes and nuts that primarily were sold in convenience stores and gas stations. The business expanded when he secured a long-term license with Sunkist Growers for a line of trail mix and freeze-dried fruit snacks. The Sunkist lines were launched into Walmart stores nationwide in 2015. By 2016, the decision was made to move into salty snacks, he said, which led to the acquisition of World Peas Brand, which at the time was making two products—roasted salted fava bean snacks and roasted salted green pea snacks. The products were sold through the natural foods supply channel in retailers like Whole Foods Market, Sprouts Farmers Market and Target. The goal was to “come out with a world of salty snacks that would fit into that whole mission” (making healthier fruit- and vegetable-based snack foods) “and be a strong addition to the produce section” in both mainstream grocery and club stores, he said. When brainstorming with company executives, investors and board members about new products for World Peas, Desai thought back to his childhood. Although he was born in Orange County, California, his parents were from India, and he traveled there quite a bit as a child. “Junk food” snacks in India are made from a base of peas and lentils instead of corn or potato like many of the most popular snacks in the U.S.
“The difference in the nutritional statement because of that (base) is pretty striking. Indian junk food snacks have two times the protein level, three times the fiber levels, and it’s all plant-based protein,” he said. About that time, Americans were showing great interest in plant-based protein, healthy eating and healthier snacking. But their behavior wasn’t really reflecting that interest: Doritos is a $2 billion brand, and Cheetos is not far behind at $1.7 billion, he said, citing IRI data. On the other hand, kale chip sales in the U.S. total $50 million or less. World Peas’ goal was to give snackers both the nutrition and taste they were seeking. That brainstorming team included a former research and development executive from a major snack company; a former food company president; and a supply chain chief from a national snack maker. They set their sights on the puffed snack category, which has been dominated by Frito-Lay’s Cheetos for the past half-century, he said. During the research and development process, which lasted more than a year, “we were obsessed with making the thing taste, feel, ‘walk the talk,’ like junk snacks,” he said. Peatos were launched in late 2017. In addition to the base of the product being different from traditional snacks, World Peas also made its seasoning free of artificial colors, flavors and MSG—things moms often are looking to eliminate from their kids’ diets. But that’s not cheap, he said. “Our seasoning four times more expensive on a per-pound basis than a traditional cheese puff would use,” Desai said. Getting the color right, and natural, was the most difficult part, but the company was able to achieve that as well. Today, Peatos are available in Classic Cheese, Masala, Fiery Hot and Chili Cheese flavors in 1-oz. and 3-oz. bags. In addition to Kroger, Peatos now are available in Walmart in the Northeast, Safeway, Albertsons, Vons and Pavilions as well as Amazon.com.